Greetings from YFL!!! It is time to get back into your routine now that Thanksgiving is behind us, and we have Christmas to look forward to, and just around the corner!!! Our physical emphasis this week is movement through the classic Vinyasa Flow style of Hatha Yoga. It will lift your spirits, and your heart rate, improve your agility, and stamina. The Sanskrit focus is appropriate for the holiday season, which is “MUDHITA”, or the energy of JOY!!! The supporting hand gesture or Mudra is “USHAS”, which evokes the energy of ALL THINGS GOOD. The meditation focus is “JOY”, and the accompanying music for your meditation is Ricky Kej’s “Winds of Samsara”, Mountain Solitude. The December YFL Newsletter will be posted on your email desk this Friday, December 1st at 10 a.m. Look for the NEW “Daily Fix”, which will be replacing the “Quick Six” section of the newsletter. As we look ahead to the month of December, the Winter Solstice Drum Circle event will be hosted by Deb on December 17th, from 5-6 p.m., and it is FREE!!! We will usher in the new season with rhythm!!! So, bring your instrument, beat, and a friend to welcome Winter!!! YFL will be CLOSED on the following dates in celebration of the holidays: 12/23-12/26/17 and 12/30-1/2/18. Otherwise we will be OPEN with our normal schedule of classes. If you are looking for healthy gift alternatives for yourself, a friend, or family member, then consider a YFL gift certificate for Yoga and/or Meditation classes. This entry was posted in Uncategorized on November 27, 2017 by Deb Potts. Greetings from YFL!!! Time to meet at the WALL for some last minute yoga prior to the holiday break for Thanksgiving!!! We will focus upon the use of the wall as a tool of resistance, alignment, and focus. The Sanskrit focus is “Dhanya Vad”, or that place in our heart that exudes gratitude and thankfulness for all that we give, all that we receive, and all that we are as a being. Our supporting hand gesture or mudra is “Grounding”. This is the season for celebration, preparation, and participation. We find ourselves coming and going, thus grounding is essential toward full enjoyment of what the holidays are meant to represent. We place the left hand to the heart, and ground the right hand into the earth. Our meditation focus is “Gratitude” over this week of Thanksgiving festivities. The music provided for this week’s meditation time is Michael Hoppe’s “Silence of the Stars”. A reminder that the studio is closed 11/23-11/26, in observance of Thanksgiving, but will re-open for its regular schedule of classes bright and early on Monday morning, 11/27. All classes will meet Monday through Wednesday of this week, excluding Nick’s 6:45 a.m. class on M/W, as he is on holiday break all week. This entry was posted in Uncategorized on November 20, 2017 by Deb Potts. Triple It!!! Restore, Renew, Relax!!! Greetings from YFL!!! 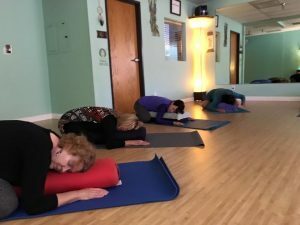 We worked hard last week with our intense “weight bearing” practice, so this week we look forward to restoring, renewing, and relaxing on the mat with deep and gentle yoga asanas. This practice incorporates support with props, a slower pace, and contemplative atmosphere. Let’s triple it!!! The Sanskrit focus is “Sat Chit Ananda”, or to have awareness of bliss consciousness. The supporting mudra, or hand gesture, is the “Pran”, which promotes vitality, reduces fatigue, and improves vision. The meditation focus for this week is “Patience”, and may be focused upon while listening to the music of Sacred Earth. I chose their peace entitled “Bhakti Hreem”, which is the energy and devotion of the heart. Intro to Yoga began last Tuesday evening, and new students may still join in tomorrow evening for this session. The cost is $40, and we meet for four sessions from 7:30-8:30 p.m. for four consecutive Tuesday nights. The studio will be CLOSED for Thanksgiving, 11/23-11/26, and classes will resume on Monday, 11/27. This entry was posted in Uncategorized on November 13, 2017 by Deb Potts. Greetings from YFL!!! This is our first full week of the month of November, so yes, it is time to “Weigh In” with the use of hand weights incorporated into our asana practice!!! It is time to sculpt, tone, strengthen, and power-up!!! Our Sanskrit focus is AUM Shreem, and this invokes the energy connection of beauty, gratitude, and generosity. Our hand gesture (Mudra) for this week is the “Ushas”, or connecting to all things good. Our meditation focus is “Thankfulness”, and may be contemplated, while listening to the music of Ricky Kej’s “Winds of Samsara”, “Heaven is Here”. Deb begins a new four week Intro to Yoga tomorrow evening at 7:30 p.m. There is still time to register, if you know someone that wants to try yoga, or refine their basic understanding of the principles of alignment, terminology, and etiquette on the mat through the practice of asanas, then send them to YFL!!! We are so grateful for your support of the studio, our teacher’s, and their classes!!! 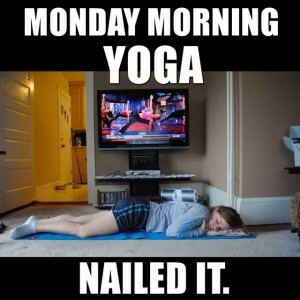 It is going to be another great week at Yoga For Life!!! We will be OPEN over the Veteran’s Day holiday weekend, but we will be CLOSED 11/23-11/26, for the Thanksgiving holidays. This entry was posted in Uncategorized on November 6, 2017 by Deb Potts.